When I started college as a freshman, I had never spent a birthday away from home before. My birthday is in the first week of September, so I felt like it would pass by rather quietly as everyone was getting used to the new semester. I knew I wasn’t going to spend it alone, because my twin sister is also a student at Virginia Tech. The two of us had plans to have dinner with a couple friends from high school, but overall, the day had a lonely feel to it because I didn’t know very many students at the start of the year. I wasn’t expecting anything when I showed up to MV practice that day, and I was having a pretty good time feeling a little sorry for myself when my section leader and Head Manager, Kelly Guthrie, pulled a giant cupcake and some birthday candles out of a Kroger grocery bag. I didn’t think she would remember; I had only told her my birthday in passing a few weeks before. The 2017-2018 Manager Section making their Game Day Pyramid. I am the person single-handedly messing it up in the second row from the top! Source: Facebook. Before that point, I really liked The Marching Virginians, but I didn’t feel like any one was really that close to me, at least not enough to get me something. To say I was touched would be a bit of an understatement; I was close to tears out of gratitude! I’m sure Kelly saw it as a nice gesture, but to me it was so much more than that. On a day I was missing my family so much, Kelly made sure I had one in Blacksburg too. From that moment on, I wasn’t so worried about trying to force friendships in my classes or find people to talk to. I knew when I went to band practice, I would be surrounded by people who meant something to me, and I knew I meant something to them. 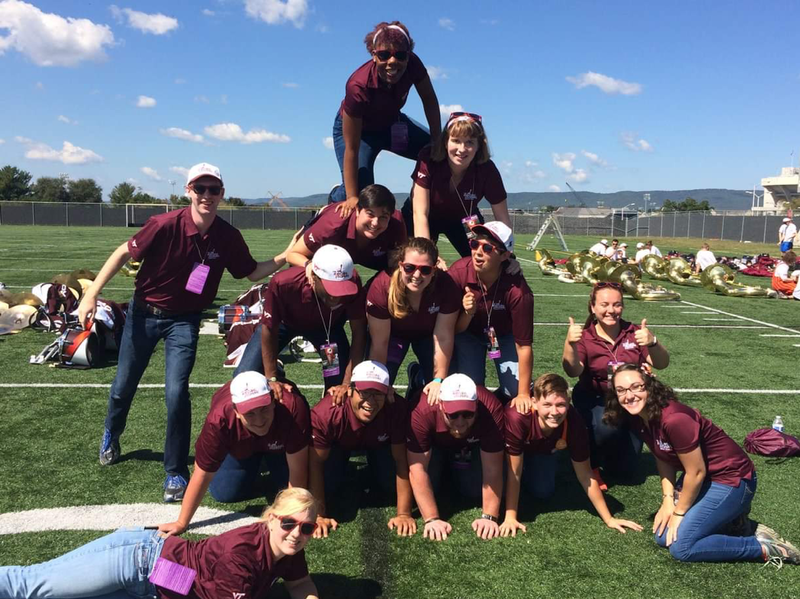 As the marching season went on, I realized that’s kind of what the Marching Virginians are about; becoming a family. There’s an inherent closeness that develops when you have to spend an insane amount of time with the same people. As a current Sophomore, I have made some of the best friends I have ever had with the MV’s and I have met people I never would have met otherwise. I knew I wanted to be a Marching Virginian so badly when I first arrived at band camp, and now I know that as long as I’m at Virginia Tech, I will be an MV.